While central Bamberg is justly noted for its old breweries and pub, the suburb of Wunderburg is almost as famous: it is the home of not one but two commercial breweries, each with its brewery tap and beer garden. Getting there is pretty easy – you can walk from the old town in less than half an hour, but given the heat we took the bus. Keesmann has an old facade but appears more 1970s inside, with pale wood and sprinklings of antler – mind you, much of Germany still seems to be in love with the 1970s... The beer garden is more of a yard next to the distribution depot, but is fenced off and garlanded with boxes of geraniums. I ignored the Herren Pils (Pils? In Bamberg?!) in favour of the excellent Sternla lager, like a bitter and faintly citrussy version of a Vienna lager. A brief experiment with the Weiss revealed it to be dull but quaffable – this turned into a recurring theme with Franconian Weissbiers. Mahrs Bräu is just over the road. The building feels much older, though perhaps that's just the dark, dark wood and worn flagstones. The irregular garden has big chestnut trees for shade, and until mid-afternoon when table service starts, you must fetch your beer from the bar yourself – this is quite unusual for Germany, though we discovered later that it is typical for Franconian country Kellers. Four beers were on tap, the best being the gorgeous Ungespundet Kellerbier, or "Oo". A hazy orange-brown, it is dry, bitter and a bit spicy, with earthy and floral notes. Very much how I imagine a bitter ale might taste if it were made as a lager, in fact. 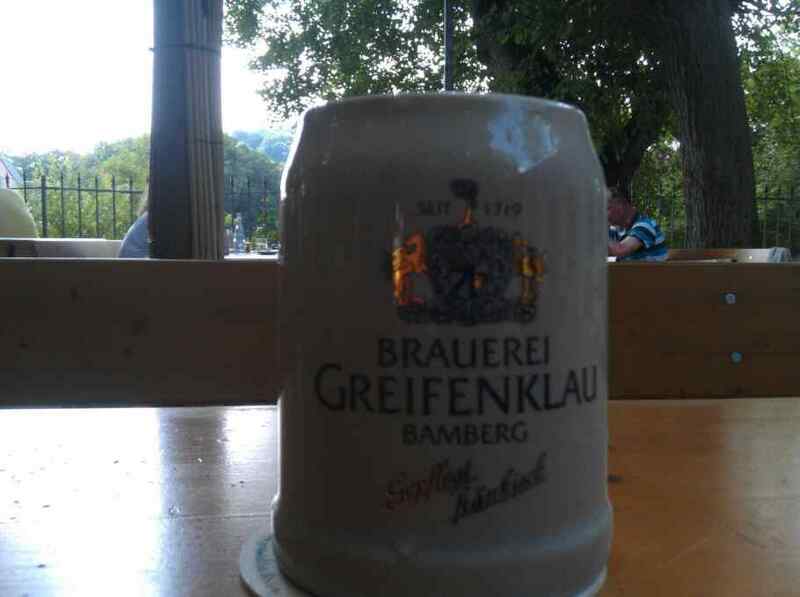 After a good lunch, it was back on a bus and up the hill to Greifenklau for a dry and lightly spicy Helles in its shady and spacious beer garden, with its great view. I was interested to notice Greifenklau has just begun brewing its own Pils too – this is not a traditional local style, but is increasingly common now. 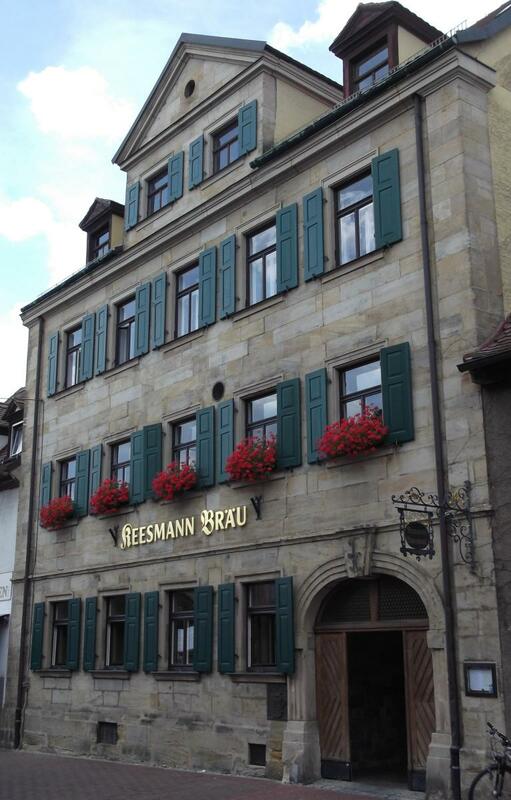 Back down the hill and walking through the old town, we were passing Bamberg's youngest brewpub Ambräusianum, so decided to take a break from the heat, although this proved challenging as there was a distinct shortage of umbrellas! It was the only one to offer a tasting flight of beers; sadly they were the typical uninspiring range I now expect from a German brewpub – a Hell, a Dunkel, a Weizen and a seasonal. The latter, a pale Dinkelbier (spelt beer) was at least refreshingly tangy and dry, and the best of a rather dull bunch. 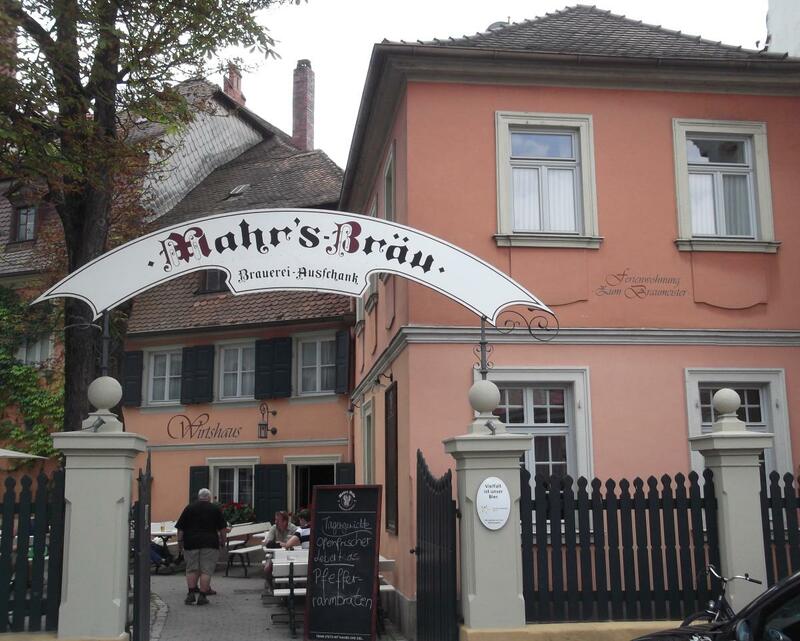 Thankfully, we were able to end the day on a higher note, with a malty, nutty and smoky Rauchbier Märzen in the courtyard at Brauerei Spezial, back across the river and not far from our lodgings.